Thinking About a Snow Day with the Family? Rare-San-Diego-Snow-Day As a California native, I get excited about the snow; I mean, really excited. After this past weekend, I know I am definitely not alone. It is kind of like San Diego/California news channels offering breaking news regarding "Storm Watch 2015" or some such headline and then the weather delivers a few small showers. 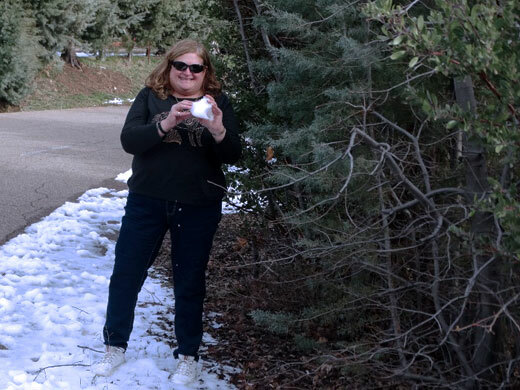 Well, we San Diegans definitely have "snow frenzy." 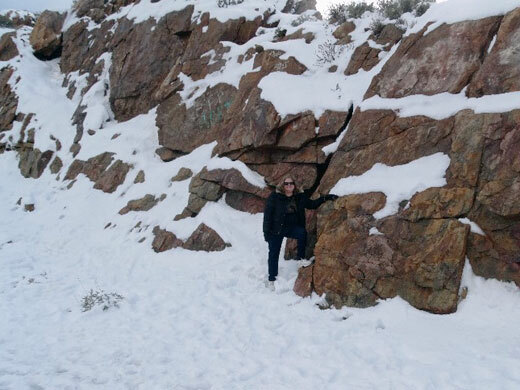 I have not been to the snow in a very long time, probably over 20 years. I love winter (even though I have lived in San Diego for approximately 31 years). Cold weather, winter storms, and snow all make me feel good, peaceful, like winter is my soul's special time of year. I have been begging my boyfriend to take me to the snow as soon as any fell in California. He was not as enthusiastic about it having grown up in Northern Idaho. His soul is happier in summer. The warmer, the better. Me, I am an air conditioning girl in the summer and in the car all the time. Saturday, my boyfriend surprised me with a trip to the snow. Our first stop was Santa Ysabel and Crossroads Treasures (reviewed in this blog on 09/18/15). Crossroads Treasures is one of our favorite places to stop as we love rocks and gems. The women who own this establishment are so amazing and a blast to hang out with. We were lucky to meet one of the local miners while we were up there and purchase and item from him. 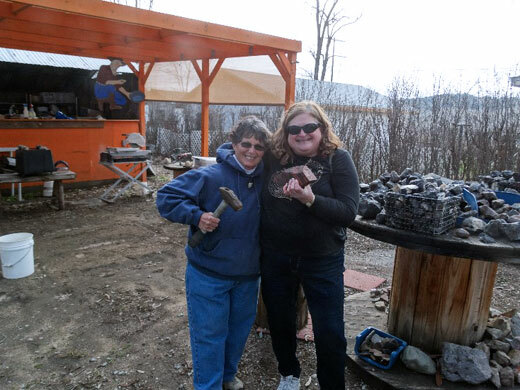 We always learn so much when we go there about rock hunting, treating rocks and minerals, and we always break open some geodes just because it is fun and exciting. (Anyway, if you are ever headed to Dudley's or Julian, this is an amazing place to stop and kids love it too). 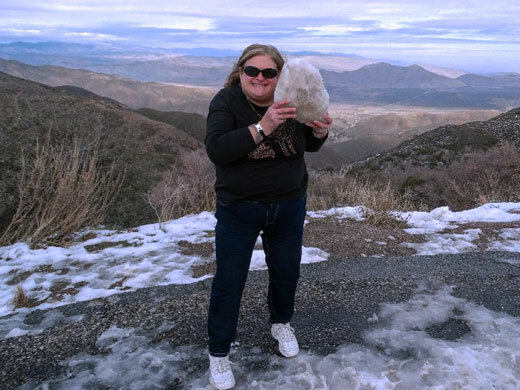 Rare-San-Diego-Snow-Day After spending over an hour at Crossroads Treasures, we headed up through Julian (the snow in Julian had melted) and wound up on Sunrise Highway. 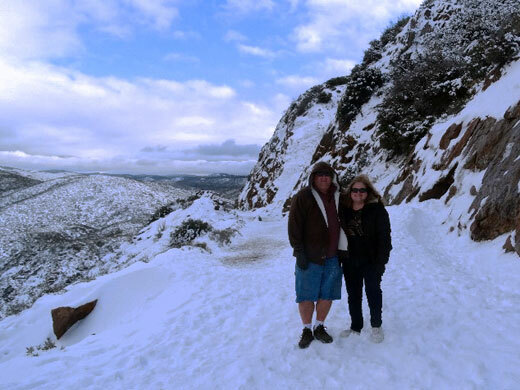 If you plan to visit the snow on a weekend, your best bet is to go through Julian to Sunrise Highway, travel through Laguna Mountain and the Cleveland National Forest and exit on the far side at Highway 8. If you turn around and try to go back through Julian, you will be stuck in miles of bumper to bumper traffic as people attempt to make the left turn back into Julian. It was a lot of time to wait in the car, especially if you have young ones that get restless easily. We saw snow pretty soon after turning right out of Julian and heading up to Sunrise Highway. We chose to pull off on obscure roads away from the crowds. We headed out to our favorite stopping point on the Pacific Crest Trail (also reviewed earlier in this blog on 09/18/15. The snow was more than ankle deep. In certain places, if the wind is blowing, a scarf, gloves and mittens, and a very warm jacket as well as a beanie or some other warm head covering should be part of your essentials for the day trip. 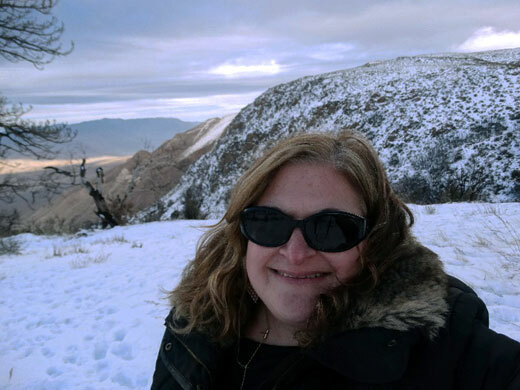 I was fine in tennis shoes, jeans, and a long sleeved shirt in the places where there was no wind, but my toes were frozen. (This was a spur of the moment trip and not planned well, but it was a fantastic day). I no longer have small children, but I was appalled at the parents letting their children climb fences onto personal property so their children could play in the snow. The parents were also doing this. There are so many places in that area where you can pull over and enjoy sledding or playing in the snow without having to trespass or damage other people's property. We spoke with one resident who said it is difficult for all the residents in those areas during the winter because of people's disrespect for their private roads, fences, and property. I was honestly shocked at seeing how many people were being completely disrespectful and taking part in this. Believe me, there is no shortage of areas to play and take photos or go sledding. 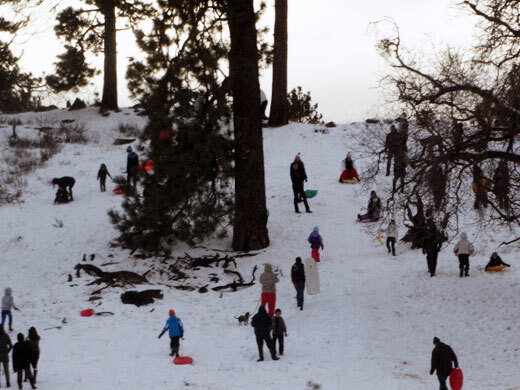 Further down the Sunrise Highway, before leaving Cleveland National Forest and heading towards Highway 8, there is a long stretch of road where many children and families were playing and sledding. 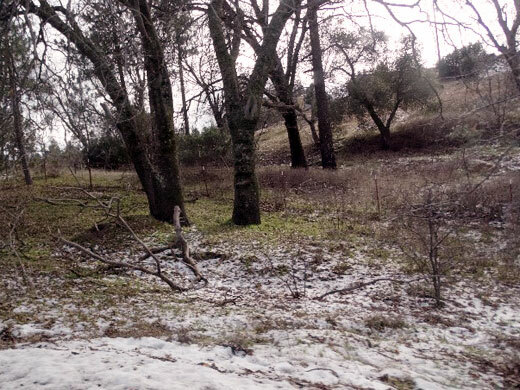 From this picture, it looks like the perfect winter day scene in California. I am not sure what happens to us when the snow comes. Reminds me of a shark feeding frenzy. I was thankful that we stayed in areas where there were very few people (all public areas). In looking at the pleasant scene above, you are unable to see the road. It is a narrow part of Sunrise Highway. Cars were parked on both sides of the street. There was a lot of slush everywhere. Tempers seemed to be high as one woman stopped her car in the middle of the road, with cars piling up behind her. Someone passed her and she threw a bottle of soda at their car! The scariest thing to me was how close to the street parents were letting their children play. The parents were also playing close to the street and throwing snowballs making their kids run out into the street. We want a snow day with our loved ones to be remembered as a fun day. So, my advice as a California snow fanatic, is to be prepared. Drive slowly and always keep your eyes on the road as kids can dart out at any time. Bring plenty of fluids, lip balm, extra sets of dry clothes, and snow wear. Bring items to sled on if you wish and please take all your trash with you when you leave. Make sure dogs are on leashes. And most of all, respect other's property. A snow day can be magical but it can also cause lots of tension. Take a deep breath and don't be in a hurry. Enjoy your surroundings, your loved ones, and make some wonderful winter memories. How fortunate we are to have beaches, mountains (that get snow), and deserts in our county. Off Sunrise Highway with the desert in the background. I hope you also get to enjoy a snow day. It is well worth it. Relax, breathe deeply and take in the gorgeous surroundings of our county.